Since my attempt at growing pumpkins in my garden was such a dismal failure this year, I've resorted to creating fabric pumpkins. This won't make a good pie, but it looks nice and adds to our autumn decor. I was inspired by the Sept/Oct 2007 cover of Creative Machine Embroidery magazine. 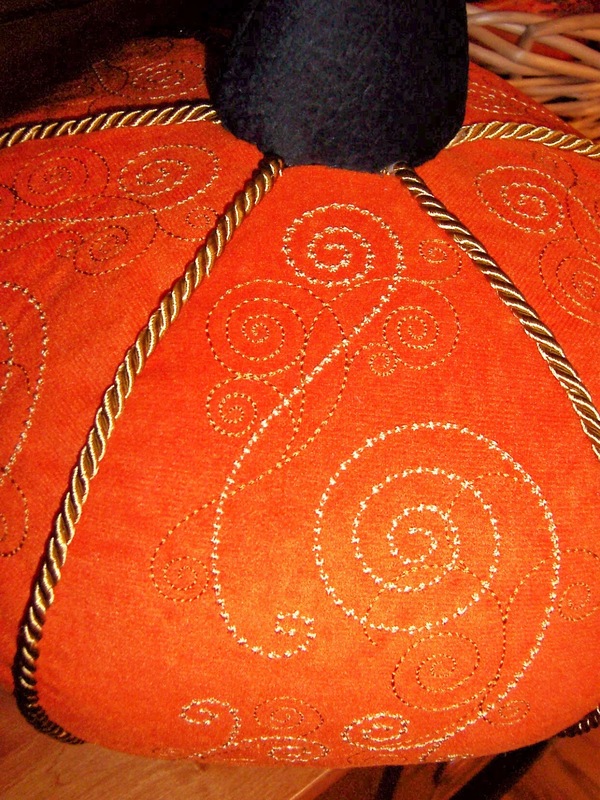 The cover of the magazine shows a pumpkin with vines machine embroidered on what appears to be a cotton fabric; the article shows a pumpkin with swirl designs on what appears to be orange velveteen. The velveteen pumpkin is the one I was trying to recreate. I found a remnant at JoAnn Fabrics that I think is a costume faux suede. Whatever it is, it was inexpensive and has a soft nap for texture. 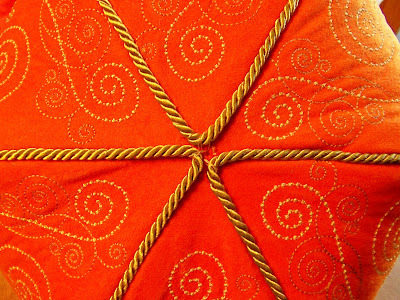 The CME article contains instructions on how to do the machine embroidery by two methods - their "traditional embroidery method" is to hoop a mesh cut-away stabilizer, use spray adhesive to adhere the fabric to the stabilizer and then proceed to embroider the various designs, re-hooping the fabric as necessary. Their "digitizing software method" involves scanning the sewing pattern piece, digitizing an outline running stitch on the cutting line, inserting and combining the chosen embroideries into the design area and then stitching the design in one step. My method was somewhere in between these two . . . first I tried to find a suitable embroidery design in my "library", but nothing satisfied me. Then, I tried to digitize my own swirly patterns and designs. Although I had some success, I still wasn't happy with the result, so I ended up purchasing and downloading the designs used in the CME article from OESD: Pack #12123, designs FB113, FB126 (swirls) and Pack #12143, designs FQ072_48, FQ071_48 (leaves). I only purchased the designs noted, plus one extra swirl design -- it was less expensive to buy 5 designs than just the 4. The article used McCall's 5201 for the pattern pieces. I don't remember why, but I purchased McCall's 5490 for my project. 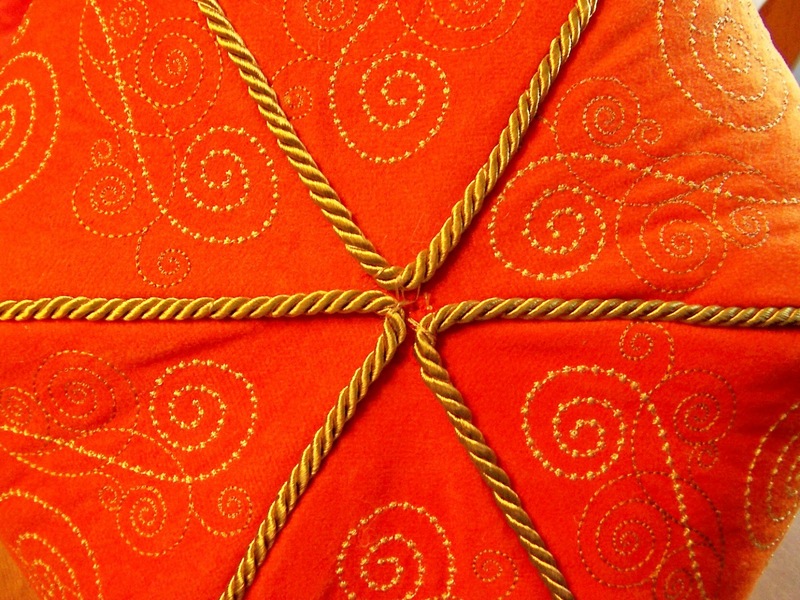 This package contains patterns for pumpkins in 3 sizes, a leaf pattern and a wall hanging. I decided to use View B, the medium sized pumpkin. My main reason for choosing this size was because the pattern piece fit in my largest hoop -- the mega-hoop (150x360). My finished pumpkin measures about 12 inches wide and is almost 12 inches tall at the top of the stem. It's pretty big, almost life-sized. I couldn't fit the pattern piece on my scanner and since it is not symmetrical, I couldn't scan half and cut and paste a mirror image without having to do more editing. So instead of digitizing an outline stitch, I just combined the swirl patterns into one embroidery design, keeping in mind a somewhat oval shape. Then, I hooped the mesh cut-away, used temporary spray adhesive to adhere a rectangle of fabric and started embroidering. I needed to play with the stitch order a bit to avoid long jump stitches and frequent changes between the P1 and P3 settings for the mega-hoop, but after the first two sections, everything proceeded fairly smoothly for all six pattern pieces. When the embroidery was complete, I used the tissue pattern piece to somewhat center the designs inside the sewing lines and cut out all the pieces. For the stem, I pulled several options from my fabric stash until I found a scrap of dark green faux suede - perfect! Before I started embroidering, I searched my stash of trims to find the gold toned cording. I didn't have quite enough for this large pumpkin, so I just had to go to JoAnn to buy more . . . just my luck, it was on sale, too. 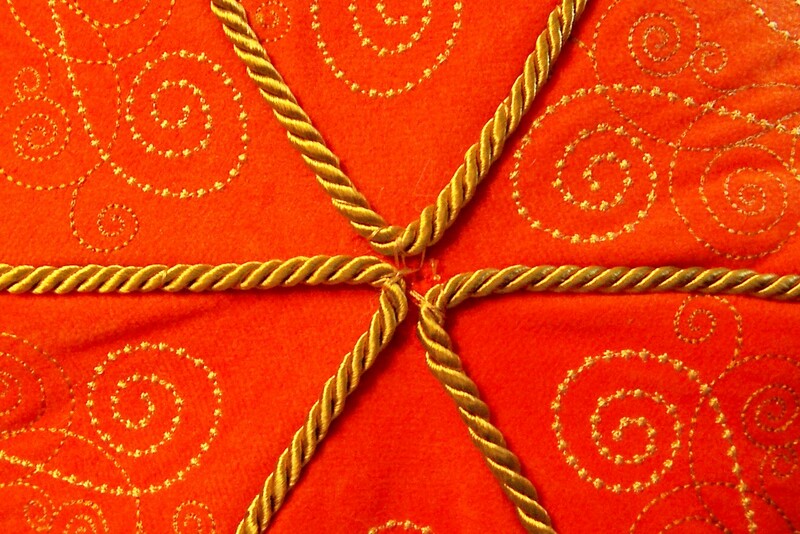 I chose rayon embroidery threads that matched and coordinated with the gold cording. Not quite perfect, but good enough for my purposes. The last step was to sew the stem to the top. Again, the sewing pattern called for glue . . . I am not anti-glue; I use it when I need to, but this is not one of those cases. 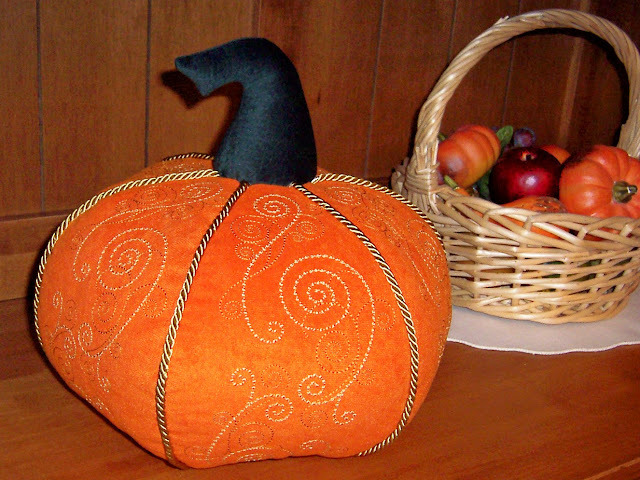 So instead I stitched the stem onto the top, stitching it invisibly by taking a bit of the pumpkin fabric, then a bit of the stem fabric until I had sewn all around the stem, then pulling the thread taut enough so the fabric edges meet, but don't pucker. At the same time, I was careful to get the cording edges buried under the pumpkin fabric. The sewing pattern and the magazine suggested covering the stem edge with trims or silk floral ivy . . . I don't think my pumpkin needs that extra embellishment, since I don't need to hide any of the construction so I omitted that step. 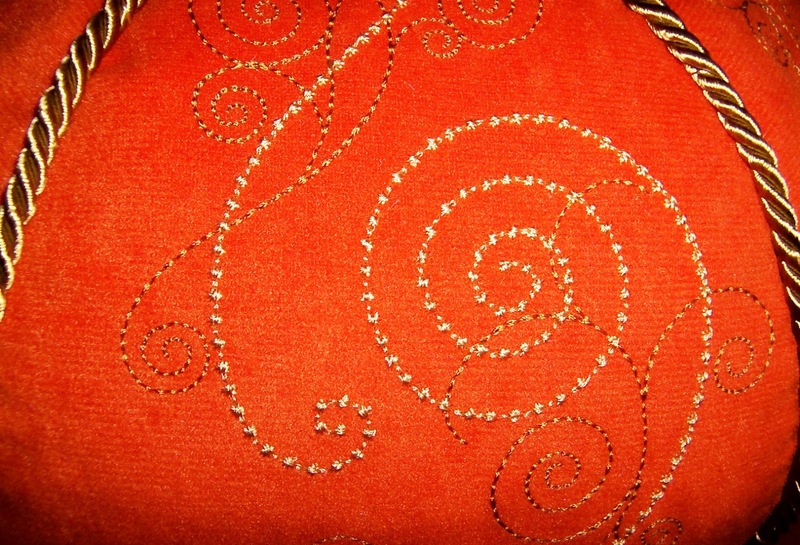 Can you believe this 100% silk was in the clearance section for $4.00/yd? There were 1-7/8 yards left on the bolt so I took it all. The woman who cut my fabrics that day gave me the 7/8 section priced as a remnant -- which were also marked down by 75%, so the entire piece cost me less than $5.00. 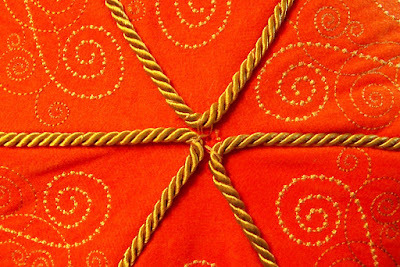 I'd like to use this orange silk to make some of the smaller pumpkins (View C) embroidered with the green vines, using both the dull and shiny sides of the shantung. I'm not sure yet what kind of trim, if any, I'll use on the seams. I have a remnant of green dupioni that would work for the stems. I don't think I've embroidered on silk before, so this should be a new challenge. I just hope I'll have time to get to it before winter!